This is the Woodland Scenics Gentle Grips Tool. Retail $8.99 SAVE 23% ! "Must have for any hobbyist"
I absolutely love these tweezers, use them on already painted parts. Keeps from scratching the paint, they live up to their name very well! 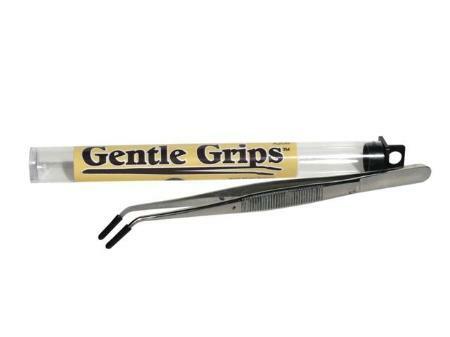 Gentle Grips is a tweezer-like tool with vinyl protective tip covers to avoid damaging figures. Extra long to reach difficult places on your layout. Ends are curved for a positive grip. I do not use these tweezers as much as I should. They have proven to be very useful in holding small round parts while waiting for glue to dry. The sleeves pull off in some applications. I suggest you glue them on. Also, the addition of the sleeves takes up valuable real-estate when working in tight spaces. Has its uses, and I like them, but application is limited.